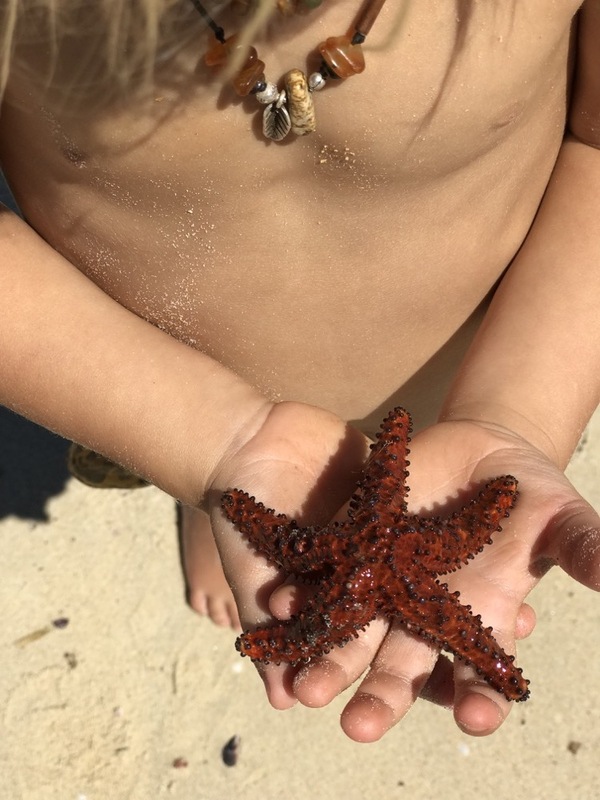 We are lucky enough to be friends with the delightful Sawyer family, a tribe of six who not only relish time spent together but also time exploring all that Mother Nature has to offer. 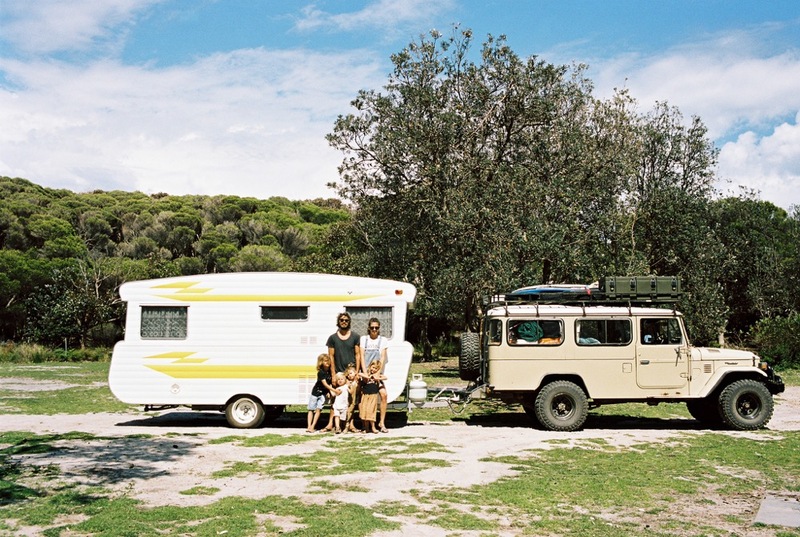 The family – Rhys, Elisa, Sunny, Lola, Scout and Tex - recently took four months off and hit the road in their troopie with their reimagined caravan Winnie in tow down the East Coast of Australia. 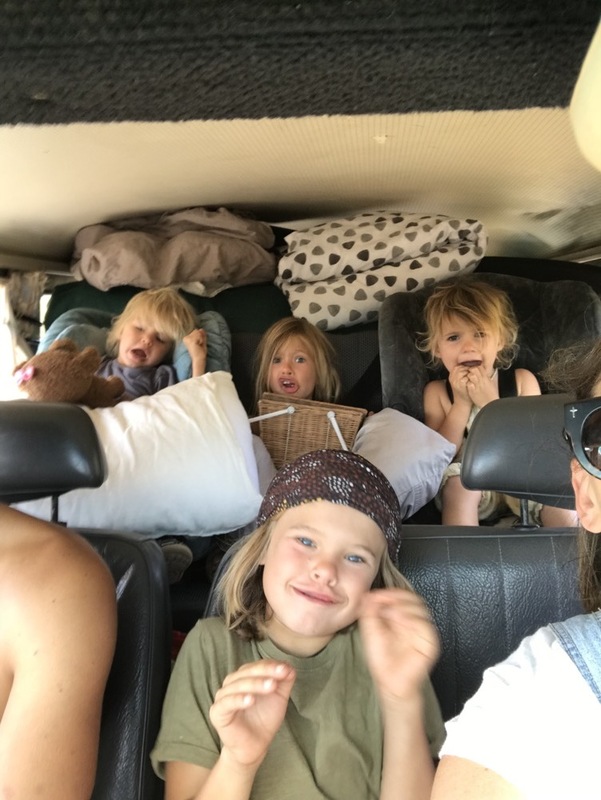 We spoke to mama Elisa about their incredible adventures and how they not only survived but enjoyed a road trip with four young kids. You recently took a road trip in your Troopie with your hubby Rhys, four kids and your caravan Winnie. Give us a brief outline of your trip/itinerary? So after a year in the making we handed our house keys over to tenants and set off in the late afternoon feeling rushed, excited and slightly terrified not even having our first nights’ accommodation booked! We completely jumped into the unknown and it took a couple of weeks to find our feet with road trips and camping but we spent the next month travelling down the East Coast staying at some of Australia’s most beautiful national parks that it didn’t take long to fall in love with what we were doing. We decided to skip Sydney and Melbourne figuring that we would have plenty of opportunities to visit the big cities in the future. We travelled the Great Ocean Road and into South Australia spending a week in my hometown of Adelaide before we headed over to Kangaroo Island and then made our way up to the Flinders Ranges. Following the coast around to Tumby Bay, we went as far as Coffin Bay then spent the last month of our trip exploring the Murray River, Victorian High Country and The Blue Mountains. A few country towns later, we were back on the beaches of Northern New South Wales and on our way home. Did you guys have a rough plan/itinerary or did you wing it? We tried so hard to have a plan before we left home but we just couldn’t get it together. I guess it was a combination of our life being a beautiful, happy mess with our four babes and just having absolutely no idea how to plan four months on the road for two adults and four little people. We had no idea how long we could spend travelling in the car with the kids, whether or not we wanted to stay in caravan parks or national parks, and really we just had no idea where we wanted to go [laughs]. 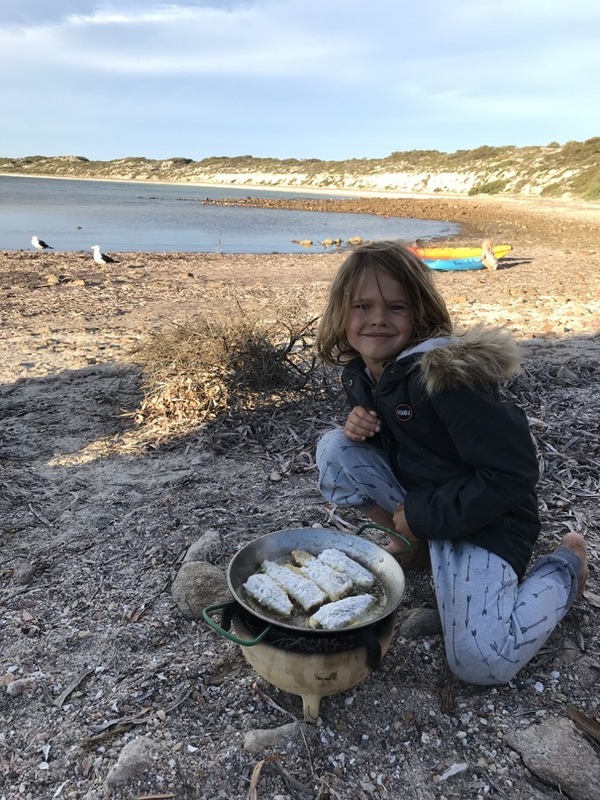 We knew we had about two months to get to Eyre Peninsula, in South Australia, and gave ourselves a month to travel home so, yes, there was a very rough plan but we were mostly winging it! What was one standout moment? I think driving the Great Ocean Road was a standout moment. It’s something I have wanted to do since I was a teenager and to finally do it in our vintage set-up with our four beautiful kids and Rhys was more than I ever imagined. The coastline along the Great Ocean Road is so breathtaking with its flat, windswept land that meets incredible limestone cliffs. We loved hanging out in all the cool little towns along the way like Torquay, Anglesea and Lorne. There is a pub at Wye River that we fell in love with and great accommodation at Cumberland River Holiday Park. It just had a great feel to it and totally lived up to expectations. Any places families should consider if they are planning a trip around Oz? Wilson’s Promontory National Park in Victoria is a great place to holiday with your family as it has wildlife, amazing scenery and several beautiful beaches to choose from. We visited Squeaky Beach [it really was very squeaky] and Whiskey Bay, where giant rock formations sit at the ends of the beaches creating hours of entertainment for the kids. There was good surf, bush walks - the list goes on! Flinders Ranges in South Australia is another spot we loved for its wildlife, history and character; it felt like a real adventure being so secluded in nature. Driving through incredible gorges, you are literally staring at land that is 540 million years old and can’t help but feel like you have stepped back in time and come away feeling more connected to the Earth. Bright in Victoria has so much to offer for families whether it is skiing in winter or swimming in the creeks in summer like we did. Sonny was pretty impressed with the fishing here, too. Kangaroo Island is another top spot with so much to explore, beautiful beaches, caves you can take a tour in and get up close and personal with the local seals! 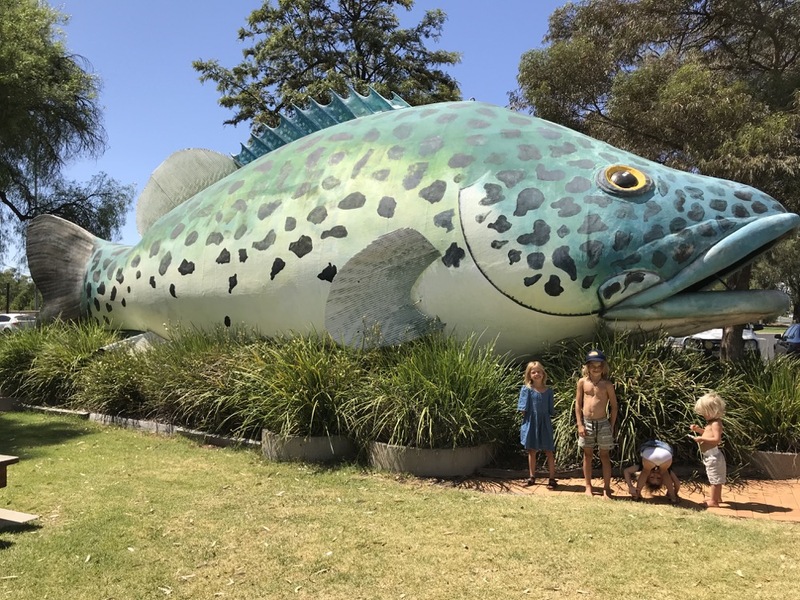 Renmark is along the Murray River in South Australia and offers a chance to get the family into the river and behind the boat. My family and I used to ski, knee board and take the biscuit for a spin on the Murray River but these days there are so many behind boat gadgets, it’s loads of fun! Australia truly is such a beautiful country with so much to offer. Any hidden gems of towns you experienced and want to share? Eden, New South Wales, is a small town with a big history. It has a great museum with tales of its whaling history. Laurieton, New South Wales, is a cute little town just outside of Crowdy Bay National Park with friendly locals and a great Italian restaurant. Mallacoota in Victoria is a really nice town with great fishing and beautiful beaches and has one of the best caravan parks within walking distance to town and Lucy’s homemade rice noodle house - yum! Echuca, Victoria, is a must if you are in the area. It is on the banks of the Murray River and back in its day it was a busy port and it still has huge paddle steamers you can go for a ride on and the old main dirt road with original pubs and a secret underground tunnel, which was so much fun! Robe, South Australia, is a beautiful seaside town with great restaurants and shops. 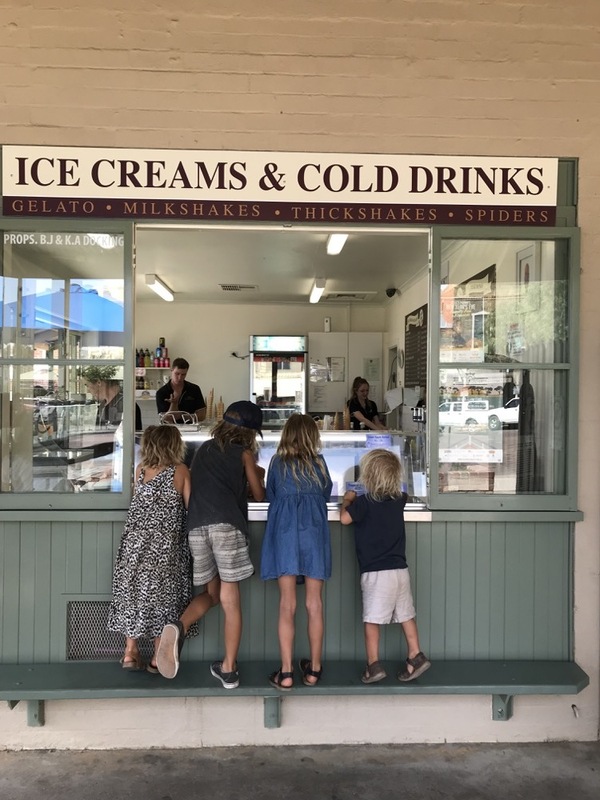 Burrah, in South Australia, won me over with its beautiful main street and heritage buildings and homes that make you feel like you have just stepped into 1940. Melrose, South Australia, was such an unexpected gem. It is a very small town with a great pub but the best part was that it is a mountain biking mecca! A bike for each family member is essential here as there’s a bike track in the creek bed for the kids and more intense rides that cover Mount Remarkable National Park. Tumby Bay, South Australia, is a seaside town that has a piece of my heart as this is my mums hometown and growing up, we spent most summer holidays loving every bit of this small town and the coastline of Eyre Peninsular. Can you tell us about your time on Kangaroo Island? We left Winnie in Adelaide with family and set off to spend five days on Kangaroo Island. The ferry ride over was just the beginning of many beautiful adventures on the island and the kids were beyond excited to drive the car onto the ferry and then hang out on the top of the boat looking out to sea. We spent our first night on the northern side of the island in a tiny cove called Western River. We arrived at night and didn’t realise how incredible it was until we woke the next morning. We spent one magic day exploring the river that ran into the most beautiful sea and hidden rock pools in the sharp and jagged rock formations. That afternoon, we headed over to Stokes Bay for a swim. To get to the beautiful beach, you have to walk through a ‘secret tunnel’ through the rocky headland and you pop out to a big natural rock pool, which is perfect for kids! Then we went to Vivonne Bay where we spent three days checking out Seal Bay, Kelly Caves and the Remarkable Rocks in Flinders Chase National Park. I feel like we underestimated the size of Kangaroo Island and would have loved to have more time to get off the beaten track. I’m putting Kangaroo Island back on the list of places to visit! You guys went to Tamworth Country Music Festival. How was it? Yeee haaaa! Traveling inland to small country towns was such a great contrast to our coastal travels. We actually had no idea the Tamworth Festival was on until we were trying to book accommodation and there was literally one caravan space left in the whole town [laughs]. We got right into the spirit of things, bought a couple of cowboy hats, the music festival guide and listened to the free country CD that came with it all the way into town! The music and young talent was so fun to listen to but just watching the kids get inspired by the musicians and dance the night away was so worth the trip. Lets face it; a road trip can be intense with two fighting kids in the back, let alone four. Do you have any tips for actually enjoying this kind of travel experience with kids? I have to say that I was so proud of our kids when it came to the driving side of things. They definitely had their moments but over all, driving in the car for hours was their thing - who would have known? Maybe we just couldn’t hear them over the Troopie [laughs] but still there were times when I just wanted to throw myself out of the moving car just to get some peace and quiet! I think trying to get the kids involved in the journey as much as possible helped keep them interested and excited for the next town or landmark. Sonny was in charge of the GPS most of the time and loved telling everyone when we were about to cross a river or how many turns of a winding road were left before we reached the bottom of a mountain. Just getting them to look out the window and asking them what they can see always sparked some sort of conversation about where we were traveling. Being in a caravan and national parks was more of a challenge for us. We live on a couple of acres at home and I’m pretty sure we don’t bother too many people - other than the cows across the road - with all the noise we make in and outside of the house so being so close to people in caravan parks was a bit stressful at times. 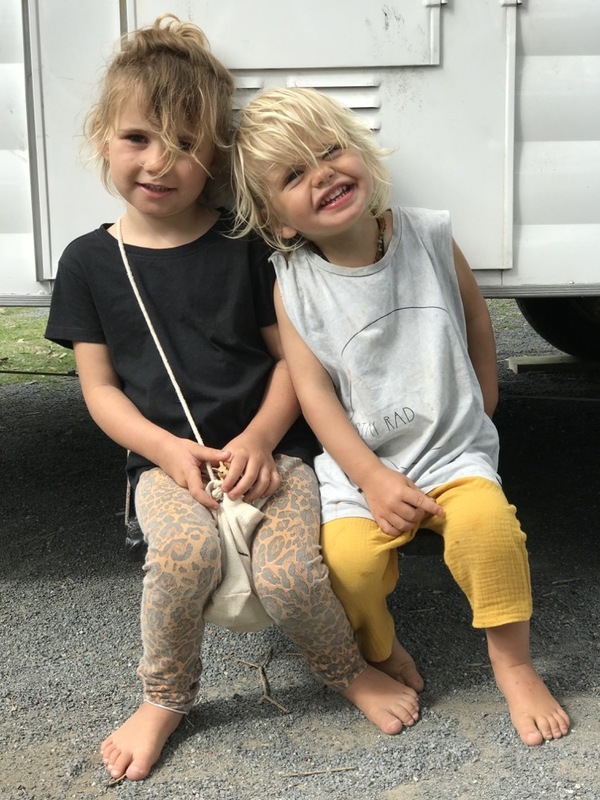 Tex, who is two, was pretty hard work in caravan parks, especially with older siblings who just wanted to ride off on their bikes or hang out with their newfound friends. He ALWAYS wanted to join in which meant Rhys or myself would have to go with them or try and keep him around the van, which was near impossible. On so many occasions, we would be busy cooking dinner to look up to see that he was gone. He would jump on his bike or scooter and take off around the caravan park! In national parks, we had to watch Tex around the wildlife as he would charge off into tall grass barefoot after a massive kangaroo to give it a cuddle and desperately wanted to hold a goanna! So basically, it was Tex the headstrong two-year-old that kept us on our toes and caused 100 mini heart attacks a day! How do you entertain four kids during long stretches of driving? Food!! [laughs] Before each long drive, we would do a shop for the next camp spot and would stock up on snacks for the drive because if the kids ever got hungry on a long drive, that’s when the meltdowns would happen. The iPad was an absolute saviour at times but we didn’t use it as much as we thought we would as the old Troopie was so noisy with the windows fully open at all times - we didn’t have air-conditioning - you couldn’t hear a movie or show. We would always break up a long drive with a mid-way stop at a lake, beach, playground, tourist attraction, local pool or even just an oval where they could burn some energy. It made such a difference. Any activities things you brought with you on the road that proved to be lifesavers? Before we left home, I put together a backpack for each of the kids with all sorts of adventure gear, binoculars, mini books on Australian wildlife, pretend cameras for the younger two and Polaroid cameras for the older two, mini first aid kit, toy cars, toy animals, notebooks, pencils and puzzles. I can’t believe how many times these toys got recycled and played with on the road through the whole trip! We packed a portable swing that you could attach to any tree branch, which was super handy. A kids’ shovel that we purchased from Bunnings turned out to be a favourite because, lets face it, digging holes is just awesome. The Polaroid cameras were so much fun, they made a photo album on the way that they loved looking at everyday. It was quite the effort to pack four kids bikes in our tiny van but we did and thank God we did! The kids some days rode their bikes from sun up to sun down and then some more with flashlights strapped to the handlebars. You guys are big on the outdoors; Sonny is the ultimate nature boy! What kinds of things did you do at each stop? Sonny is such a nature boy and he inspires the whole family to get amongst nature. He loved learning all the basic skills for living outside like fishing, carving, making fires, cooking, tracking animals and insects, riding bikes and surfing. For his birthday, we bought him a child’s ceramic fire pit with a cook-top so he had to learn how to build a fire and then cook his own food. He loved it and wanted to cook every night. I packed things like marbles, knitting and sewing needles, modelling clay, UNO cards and books that they all loved at each stop. We also did loads of day trips at every stop and we would have a look at a map or ask a local about nice places to see in the area. We found so many great waterfalls, creeks, beaches and secret fishing spots at every stop. How did the experience change you as a family? The trip has most definitely shifted our perspective on life in the most beautiful ways. Living with less was such a great eye opener as to how much we really need in life, and we found it wasn’t much in our little van! I feel like how we lived before we left with all the ‘things’ we surrounded ourselves with around our home, created stress and it was such an uplifting experience to feel free of that. It was good to come home and let go of possessions that weren’t needed. Living in each other’s pockets for over three months brought out the best and worst in all of us at times but moving forward from the hard times brought us closer together and I’ve never felt like a stronger family unit. Watching the kids spend so much time in nature learning and appreciating the beautiful world we live in is a change that I hope will stay with them forever. Tell us about your set up! Where on Earth did you all sleep? We travelled with Winnie our 1969, four-birth, 16-foot caravan (yup, four birth!] and also purchased a great camping set-up before we left for the more off-the-beaten-track camping which is a an Oz Tent RV5 with the tag along! I would have to say our sleeping arrangements were quite the challenge. Basically, we didn’t all fit in the van [laughs] but for nearly four months, we made it work. Tex and I slept on the dining table that folded down to a bed a bit smaller than a double. Rhys slept next to Scout on a bed that is about half the size of a single, Lola had the luxury of the other half single bed to herself and Sonny slept on the floor [laughs]. Rhys and Sonny definitely got the raw deal on the sleeping arrangements! There was about a half a meter of floor space left in the van. When we used the RV5 tents, we had three of us in each side. To be honest, it wasn’t that comfortable but we were having such full days that we were asleep before our heads hit the pillow and in the end, it just became the norm. Did you cook all of your meals, or did you eat out, too? We actually cooked most of our meals! As hard as that sounds for six people, three times a day out of a caravan, it was easier than being in a restaurant with our four little crazies. Most of the time, we were cooking the same meals that we cook at home. We liked to visit the local pub in most towns for a meal, and they were definitely the most family-friendly places to eat out. Feeding a family of six, we also had to budget wisely and eating out was always very costly.